Virtual-Terminologist is a website that offers customization and import services for Trados termbases. Additionally, they make available for free download a few termbases (French-English language pair only, so far), and have an informative page on the Cardinal Virtues in Terminology Management. Is there a catch with Trados? I am getting a 775 page-translation in a technical field from English to French and am not using anything presently. Or is there something better that you can recommend. 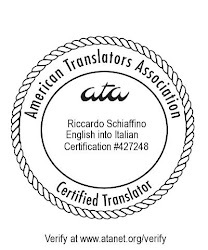 I have a translation degree and will be making translation my livelihood. Apart from a few bugs, Trados works fine: the problem is that it is expensive, and that it may be a bit challenging to learn at first. Bear in mind that if you use it for the first time on a project for which no previous translation memory is available, the time savings offered by the translation memory are going to be limited. You might want to first try a less expensive tool, such as Omega-T (which is free, but is not useful for certain file formats), or WordFast (which costs about a third as much as Trados, and works in a very similar manner). How about if I simply use Word or Excell to create my personal bank. Am I stuck with that format then and is it exportable then? I was also thinking of purchassing the professional version of Reverso. Is that worth it? Nothing like Babelfish I hope. I'm not really sure what you mean by "use Word or Excel" to create my personal bank: if you use any translation memory tool (Trados, Wordfast, etc. ), you would use them to translate your Word documents (or other types of source documents), and this would create a databank (a translation memory) that you use with the tool. Most translation memory tools can export their memories to a common format (called TMX) which could be opened by other translation memory tools. You can use Excel (and even Word, but it would be more complicated) as a tool to create a glossary, and such a glossary could then imported into your translation memory tool; this is something that would require some manual operations, but it is a useful operation and can be done (especially in order to import in the translation memory tool glossaries or other information one had created previously). As regards Reverso, I have no experience with it, but if it is a machine translation program, I would be very wary of using it for a professional job: you could easily spend too much time post-editing the machine translation output. I have none of the translation memory tool (Trados, Wordfast, etc.). I am getting a large document to translate with possible repeats. Would they be a wise investment for an individual translator? I work from English to French. Also, I am thinking a creating a base glossary in Word. Why is that more complicated than Excel? The translators I will be working with use Excel glossaries and I wonder how hard it to convert the Word glossary in Excel so perhaps I should start in Excel right away. How hard is it to build a glossary in Excel? Can it then be integrated into the translation memory tool (Trados, Wordfast, etc.? I also heard of Coretext. There is a rebate on it presently. A translation memory tool may be a wise investment for an individual translator... if that translator normally works with the kind of documents that benefit from it (like technical documentation, web sites, etc. ), that is documents that normally have a certain amount of repetitions, and that tend to be updated to new versions. I would not invest in a translation memory tool just for a single project: on a single project you would not see much savings (although you would if that single project would later return for the translation of a new version). A glossary created in Excel can be imported directly in MultiTerm (the glossary component of the Trados toolset), so that would always be my choice. Also, it would be much easier to export a glossary created in Excel to a text-only format (e.g., csv), for use in other tools, such as ApSIC. In Excel, you can create a bilingual glossary easily, by using a column for the source language entries, and the next column for the target language entries (and maybe a third column for definitions, etc.). I'm afraid I don't know Coretext, so no opinion about that. I have a copy of Quattro Pro X3 from the Word suite, instead of Excel but it does not appear that I can convert it into an Excel mode, a feature offered by Word..Could Quattro do instead? Will it be compatible with a future translation memory tool? Or should I try to get a copy of Excel? Are you sure you cannot "Save as" to an Excel format from Quattro Pro? I find that very surprising: I know that one can save to Word format from Word Perfect, and I would have assumed that that would mean you can save a Quattro Pro file to Excel format. In any case, if you can save a Quattro Pro file to comma delimited or tab delimited text format, a program such as MultiTerm should be able to import the glossaries. The procedure to do that, however, might be quite involved, and I believe it is explained in the MultiTerm technical documentation. Yes, you can and it is offered as an option when you open it, that is it offers you to work in Excel mode. But as I build the terminology data bank, I cannot copy-paste words from my Word document nor my (Canadian) Termium and that is time consuming. I wonder if that is also the case with Excel.